Hopefully all of my fellow American readers were able to enjoy a Happy Thanksgiving and an extended weekend. We hosted our first Thanksgiving and overall it was a great day spent with family. While taking some time to unplug from the blog and social media, I was able to jump online briefly on Black Friday and make a couple of purchases for my dividend portfolio. One of the purchases was my standard monthly contribution to the Vanguard High Dividend Yield ETF while the second was one of my most underweight positions that I’ve wanted to add to for some time but just didn’t feel that the price was right–Target. Target Corporation is a company that is familiar to many within the United States, and my Canadian readers might be familiar with as a result of the company’s brief yet unsuccessful expansion into the north. The fact that comes to a surprise to many is that Target was founded in 1902, as it wasn’t until more recent years that their expansion really began to spread across the United States. The company is headquartered in Minneapolis, Minnesota and as of earlier this year the company operated 1,826 stores. There has been a growing concern that companies like Target would face a steady decline due to the power of companies like Amazon and Walmart that are dominating the online space, however Target has been diligently working on improving their e-commerce experience. In addition, from the perspective of the in-store customer, I know that my wife and many of our family and friends flat out refuse to shop at Walmart because their stores are dirty and unorganized. Target on the other hand tends to be spotless and well organized throughout, and it is not unusual for people we know to go into the store for one or two items and leave with a cart full of items. I’ve been wanting to add to my position in Target for awhile now, as it has been one of my most underweight positions, however the price was at a level that I felt was too rich for new capital. Fortunately, the market volatility coupled with what I consider to be an overreaction to a modest earnings miss of $0.02 for the third quarter hammered the stock down over the last week with much of that decline coming in a single day. However, looking beyond that and considering facts such as how Target had a 5.3% increase in comparable store traffic, 3.2% increase in comparable store sales, and 49% increase in comparable digital channel sales had me eager to add to my position. That last point gives me reason to believe that Target is capable of competing online with the big boys as well, and they should continue to improve as this is an area of focus at a corporate level. According to Simply Safe Dividends, Target Corporation checks in with a Dividend Safety Score of 75 meaning they consider the dividend to be safer than the average company’s dividend. Target has a long-standing history of increasing their dividend as well with 51 years of consecutive increases, which places them in the category of Dividend Kings that have had 50+ years of rising dividends. Speaking of rising dividends, while Target has slowed in recent years, they have a history of healthy dividend increases. Given a recent focus on remodeling existing stores and now revamping their toy department in an effort to capitalize on the closure of Toys ‘R Us stores, I am expecting modest growth in the mid to high single-digits for the next few years. With the sharp drop in Target’s stock price last week after their earnings announcement, I was able to do some discount shopping on Black Friday by adding to my position. I was able to add 15 shares at $67.45/share and that will add an additional $38.40 in projected annual dividend income. Overall, this increases my position in Target to 22.05 shares. While still not one of my larger positions by any means, I am happy that I had the chance to move them up from the most underweight position at a price that I feel is quite attractive. As I make an automated monthly contribution of $525.00 to my Vanguard account and use that to purchase additional shares of the Vanguard High Dividend Yield ETF, I won’t include any additional background or analysis. This purchase is truly on a “set and forget” basis where I buy monthly regardless of price as I am comfortable with a more hands-off dollar cost averaging approach with this diversified holding. The 6 shares of VYM at $82.82/share will add an additional $15.30 to my projected annual dividend income. Overall, my position in VYM now stands at 132.667 shares. Once I reach a holding of 200 shares in VYM, I may redirect that monthly contribution to my Fidelity account to invest in other DGI holdings but for now will continue to add to this ETF. While I may not have been a traditional Black Friday consumer, I was able to make two stock purchases at what I consider to be attractive prices and in the case of Target received a healthy 10-15% off coupon. Considering that I had originally been watching Target for an additional purchase at a price below $80.00/share, being able to pick up 15 shares below $68.00/share was a fantastic opportunity and one that I believe will pay off in the long run. I’d still like to add a bit more but will continue to remain patient and see if I can obtain an even better price. Overall, I was able to add an additional $53.70 in projected annual dividend income. That brings my current total up to $5290.63 and leaves me only $209.37 away from reaching my revised goal of $5,500 in PADI! Had I reset my goal to $5,250 as I initially contemplated, I would have already surpassed that as well. Therefore I feel that the bar was reset at an appropriate level, and while it won’t be easy to achieve, I do think it is is within reach if the right buying opportunities present themselves over the next month. Do you currently own TGT or VYM? TGT doesn’t seem to get the credit it deserves. Yes Amazon is the elephant in the room and there are people that prefer to only shop online, but there is still a need for traditional retail stores. Target and Walmart are still some of the biggest players and both of their online sites are increasing in sales every year. I picked up some more shares of TGT after last year’s big pullback. It has gone up a lot this year since then, proving it still has some fight left. 50 years of dividend increases is outstanding. It always seems to dip around this time so this current dip makes for a great entry point for some or being able to add more to a position. I plan to hold TGT long term so I am a fan of the buy. Should add some nice dividend income for you. Thanks Daze, and it sounds like you got in at a good entry point! I’d definitely like to add some more in the 4-5% yield area and will enjoy the dividend until that opportunity might present itself. Congratulations on the purchases this month DivvyDad. 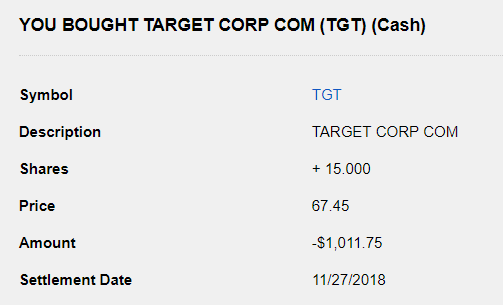 Target is an amazing company to own shares of. Been holding this company since early 2017 before it took off. While the earning miss is unfortunate, sure is nice to see that price drop. Great buying opportunity for sure! Plus this Black Friday was crazy at both my local Targets. I can definitely see that share price going back up to test it’s 52 week highs. Thanks Dr. D, and very nice that you got some at a good price! I almost dropped this one from my list when building my portfolio earlier this year but I decided I had to buy a little, and then it went on a nice run up. So I am thrilled to get the chance to add some more. We didn’t go out for any Black Friday shopping but I know in years past, our local Targets have been insane with the number of customers. wow over 50 years of dividend increases… i had no idea. Ill basically echo what daze said. there will always be a place for brick and morter stores imo. Thanks PCI, and I know that history was a surprise to me when I first started researching DGI stocks. I agree about the B&M stores, and the ones that can blend that mix of online experience with the physical store (e.g. return items locally, order online and pickup at store same day, same day delivery, etc.) will be extremely well positioned IMO. I have a solid position in Target, big aristocrat and you hope that they’re big & smart enough to figure it out. Further, they have great “hooks” to keep member loyalty – carthweel & red card – simultaneous staples. Do not own VYM yet, but am always okay with consistently purchasing a diversified ETF, and one that pays a consistent dividend, nonetheless. Thanks Lanny, and you’re right about those hooks! My one frustration with Target is that they seem to block mobile reception in their stores and you have to resort to their WiFi connection that always seems to be super slow. Re: VYM, part of my desire to hold that is my roots in index investing but I cannot complain about a holding that pays ~3% yield and has had an average of 9% growth over the last 5 years. Thanks Tom, and I think I had commented on your post that I was looking for a price below $80/share to consider buying some more so I definitely scored a discount here. I would have added a little a more if I had more capital ready to go. I agree with you on VYM, and I think once I reach that 200 share level I will taper off and only make buys on occasion. For now I am just using DCA to build that position. Congrats on adding $54 in forward dividends! I have no doubts you’ll reach $5,500 PADI by year end. Keep making every dollar count as the Diplomats say! As far as TGT and VYM go, I don’t currently own either. However, I do believe both will prove to be solid investments. I especially like your TGT purchase. TGT faces challenges in this environment like any retailer, but a dividend king at a bargain? Who could pass that up? Thanks Kody, appreciate the support and encouragement! Definitely agree that it is difficult to pass up when a Dividend King is on sale! That’s a nice way of shopping on Black Friday. I don’t own TGT or VYM but was considering TGT at some point. When I saw the drip in price of TGT (I think it was ~11% in a single day) it got my attention as well. It is currently in my watchlist and I may initiate a position shortly in case the price drops below $70 again. Great job and let’s see if you manage to reach the revised goal of forward annual income! Thanks BI, and definitely my preferred style of shopping! That single day drop is what grabbed my attention as well, as I wasn’t counting on them dropping but the market really reacted to their earnings announcement. Lining up what I will be watching over the next few weeks and am hopeful that I’ll see some good entry points! I like the TGT price you obtained, DivvyDad. It was a swift pullback, perhaps aided by the strong run up in price in recent months. Their last dividend increase was a bit disappointing, but perhaps they can get back to high single-digit or low double-digit growth. Let’s hope for a strong holiday season for TGT. Thanks ED, it does look like I was able to get it near the bottom of the drop which is always nice. I agree re: the latest increase, and my perspective is to watch for when they complete all of the remodeling they are doing to stores as a point where I would like to see the increase bump back up. Our local store has revamped their toy department to try and capture more sales due to Toys ‘R Us closing, so I’m right there with you hoping for strong numbers from the holiday season!